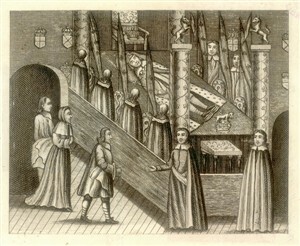 Purple velvet, gold lace, ermine trimmings, a sceptre, an orb and, most surprising of all, a crown, formed part of the lying-in-state at old Somerset House of Oliver Cromwell, His Highness the Lord Protector, from mid-October until 10th November 1658. This was dressed in black velvet and more than one layer of purple velvet trimmed with gold lace and ermine. An engraved and gilded sword was placed around its waist and in its left hand was an orb and in the right hand a sceptre. Most striking and extraordinary of all was a crown placed on a gold chair behind the effigy’s head. Midway through these quasi-regal proceedings the effigy was placed in an upright position and its glass eyes, which had been closed when it was recumbent, were opened, fully, and the crown was placed on its head. This process seems to have been based on the one adopted for the effigy of King James I (VI of Scotland) at its lying-in-state in 1625 and was quite possibly intended to impress and overawe those paying their respects with all its “kingly” power and glory. It is hard to believe that Cromwell, who refused the crown in 1657, would have approved of this approach. For the state funeral, the effigy was placed in an open chariot covered in black velvet and this rode in a long procession made up of many participants - from foreign ambassadors to the Lord Protector’s personal servants – and which took several hours to reach Westminster Abbey. There, without any service whatsoever, the chariot or hearse was simply placed in the Henry VII chapel where it and the effigy stayed for several more months. 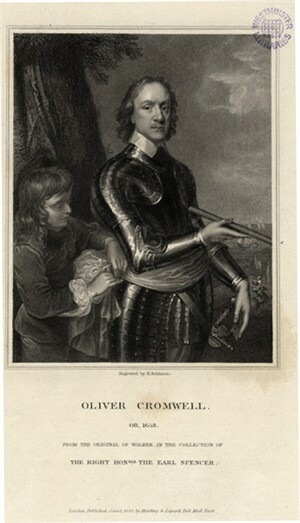 Cromwell’s body had most likely been buried somewhere under the chapel and even today some question whether the body, exhumed for public humiliation and “execution” at Tyburn in January 1661, was really his. What cannot be denied is the fact that the man, in effigy, had been treated as a King in all but name during a nearly month-long lying-in-state at Somerset House - something many a true monarch might have envied.